Officer Brandon Smiley was recognized as Shiloh’s 2018 Officer of the Year at the Village Board meeting on Monday. Pictured from left: Mayor Jim Vernier, Chief Rich Wittenauer, Smiley, and Sergeant Jerod Allen. 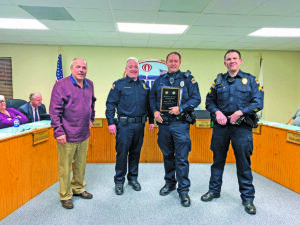 SHILOH – At the Shiloh Village Board of Trustees meeting Monday, Shiloh Police Officer Brandon Smiley was recognized as the 2018 Officer of the Year. Chief Rich Wittenauer presented Officer Smiley with a plaque and read aloud his merits with the Shiloh Police. Mayor Jim Vernier also thanked Smiley and other officers gathered at the Shiloh Municipal building for their service. Wittenauer said Smiley was nominated by his supervisor, Sergeant Jerod Allen. “Several other officers were nominated but Brandon was chosen,” Wittenauer said. On top of Smiley’s regular duties as a law enforcement officer, he is also a field training officer.